Redearslider.com :: View topic - I need more help. 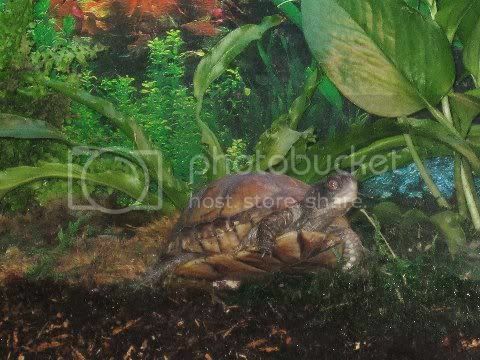 Box Turtle and Tortoise Discussion :: I need more help. 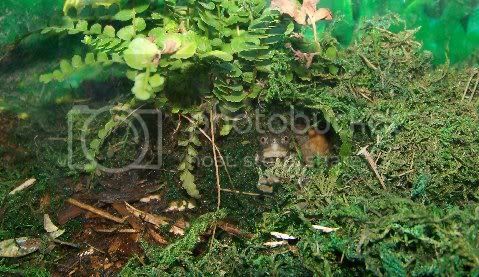 When my boxies are inside for the winter, I keep them in a planted vivarium. I tried everything and nothing held humidity as well. That's why I was interested in your little water pond. They all go out for the summer, and this year will be the first time the Juvies will stay outside and hibernate. 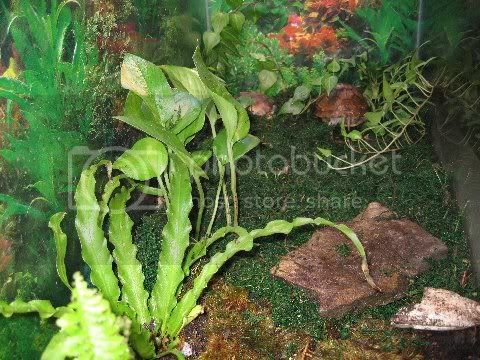 I just use regular tropical house plants, a mix of soil and peat moss, and green moss on top. I don't use any hides. They dig down in the moss. For light I use a 10.0 UVB, or 5.0 on the smaller vivs. For heat just a regular day glo. 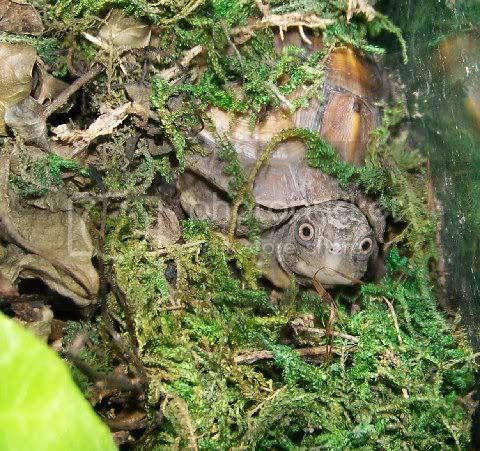 If my smaller guys don't come out to eat, I just mist the whole viv and water the plants and they come out. When it rains outside boxies come out to eat. 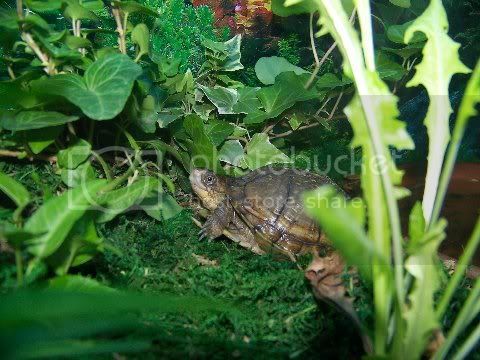 Try misting the enclosure and watering the plants and you might stimulate him to eat more. Terry, I just love that last pic is great! Thanks Steve. That's Chewy, 1 1/2 year old Eastern. She has these big, big eyes. Very friendly, curious and so un-afraid from day one. What a cutie. how big is Chewie? I'm wondering how big to expect my hatchling to get in one yr. I have a question for you guys. Do you think it would be ok to put a couple rosy red feeders in the pond I built? Not really for food, more for the looks. By the way, I will be posting some pictures of the setup sometime this week, as soon as I get my sisters camera. I don't see why that would be a problem. I'm making a new boxie enclosure outside now and I'm putting a pond in the enclosure (not too deep) and I'll probably put some little fish in there too. I put a few tadpoles, from my big pond, in my Redfoots enclosure last Summer, but he went in there and ate them right after I put them in. I'm sure if your boxies can catch them, they will eat them. Don't forget to post some pictures. Last edited by RR38 on Thu Mar 11, 2010 9:59 pm, edited 1 time in total. That's a great looking enclosure. Did you make that? And what kind of water dish is that? Really nice. You could add some more plants in there and mix the substrate with a little soil so it doesn't get in her eyes. I love that little face looking out at you. Yeah, made it myself. The setup is 48"L X 18"W X 18"H. Used some leftover wood from work, sprayed it with some polyurethane and for good measure put a layer of plastic down. The water dish is just a rubbermaid dish I bought from walmart for 5 bucks. I had a old whisper canister filter I tore apart and took the pump out of. With a little modification I added a tube to direct the water over the rocks to make a tiny waterfall. I used an old 48" shop light for my UVB and plant bulbs, I just built a box around it to hide the fixture. I am going to add more plants eventually, I am waiting for the plant nursery I go to to open up, then I am going to add quite a few more. What kind of dirt should I add? I have heard potting soil without perlite. 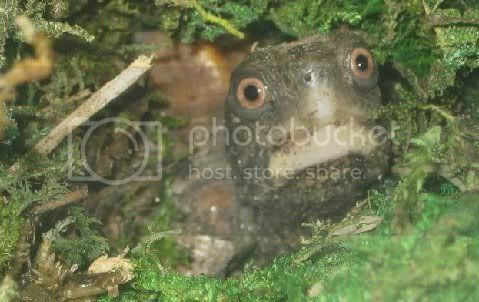 Right now I use a mixture of 70% zoomed ecoearth (coconut husk) and 30% zoomed reptibark. The mix holds moisture well. Could I add the dirt to the mix I have now? Also do you think it would be okay to add another boxie to this setup, or is it only big enough for one? There I go again on my question parade. Last edited by RR38 on Thu Mar 11, 2010 10:09 pm, edited 1 time in total. I think it's big enough to add another one. I would just add some soil without the perlite (they would try to eat it) and mix it up. On one side of my viv. I put a lot of terrarium moss on top of the soil mixture, and they just dig under that. You could also add some leaf litter. I just get some from under a tree in my yard. 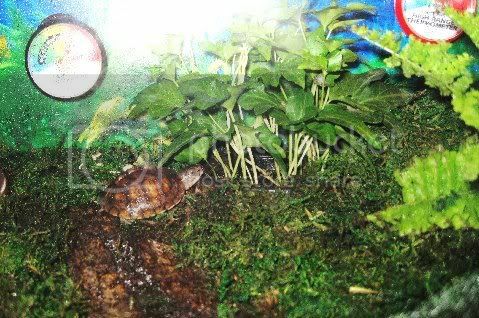 Crumble the dried leaves and put that on top of the substrate. Just make it as natural as you can....like the forest floor that they would come from. You're on the right track, and I really like your enclosure. Thanks terryo for all your help and advice you have given to me.